Diamonds have lost their sparkle as more women feel the need to be different, straying away from the traditional diamond engagement ring. Recently many are opting for unique designs and coloured gemstones, we refer to this as “The Kate Effect” – sapphires and rubies have outpaced diamonds! Today we celebrate the birthstone of July, the Ruby! From royalty to celebrities to your every-day-bride, the striking red stone is replacing colourless diamonds. Let’s take a look at some of the most expensive ruby engagement rings. We can only hope this magnificent ring was ours! But this beauty belonged to Brazilian born billionaire Lily Safra. 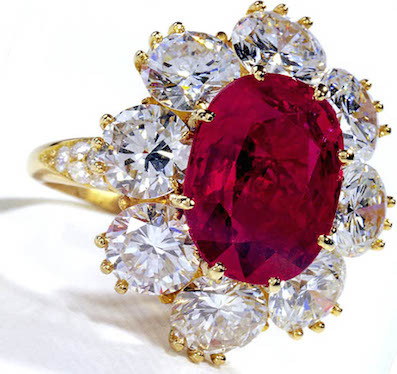 When this spectacular ruby and diamond ring was up for sale at a charity auction it fetched a whopping $6.2 million! Weighed at 32.08 carats, this ring was created in 2003 by Chaumet. The design comprises of a cushion shaped Burmese ruby bracketed within four precious diamonds. The sales from the Hope Ruby is said to benefit a number of charities. When Elizabeth Taylor’s jewellery collection was presented at a Christie’s auction, the Richard Burton Ruby was an instant hit amongst bidders. The stunning ruby and diamond ring fetched a staggering $4.2 million! A gift for Christmas from husband Richard Burton in 1968, the 8.24 carat oval shaped ruby is surrounded with 8 round brilliant diamonds. Further diamonds set on the shoulders decorate the 18ct yellow gold band. The Graff Ruby was the best seller at the Sotheby’s Geneva auction held in 2011. 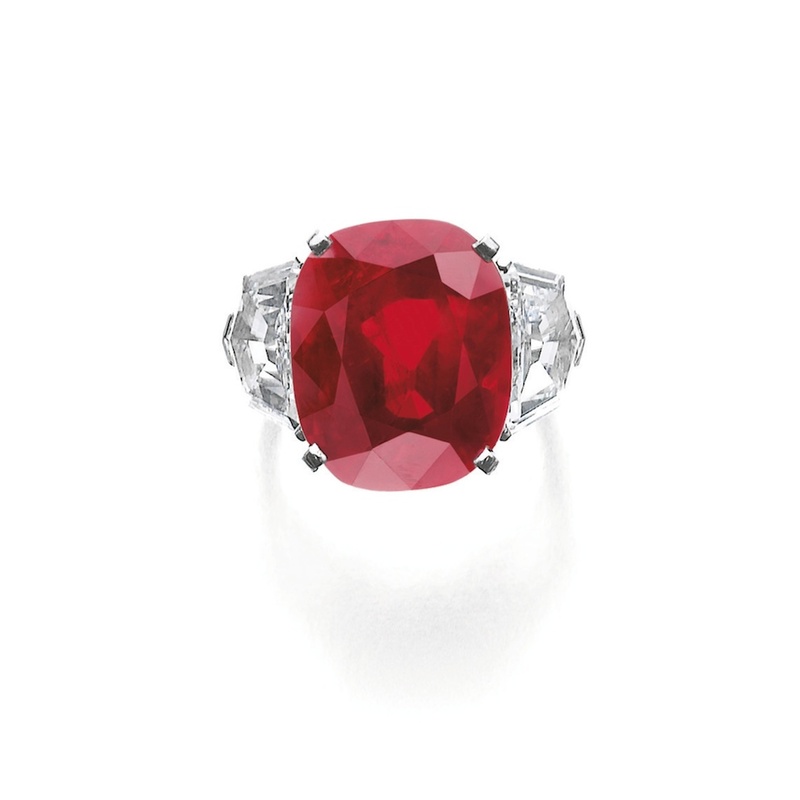 From the collection of Dimitri Mavrommatis, this majestic ruby and diamond ring raised an incredible $8.6 million! The 8.62 carats Burmese stone possesses the rare vivid red hue known as “pigeon’s blood,” the ruby has outstanding clarity. Triangular and round brilliant diamonds set on the band add excellent brilliance to the ring! 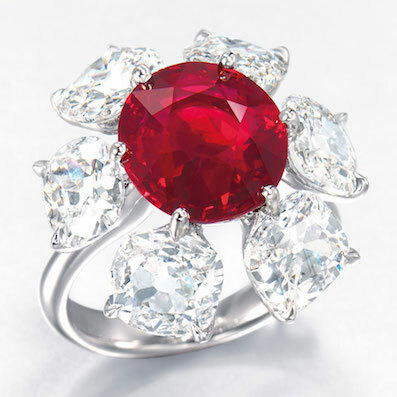 A superb ruby and diamond ring famously made $3.3 million at Christie’s in 2012. Not much is known about this distinctive piece, apart from the fact that it was made by Etcetera in Hong Kong. Designed to imitate a flower, this ring consists of a 6.04ct oval shaped Burmese ruby held within several cushion-shaped diamonds mounted in the 18ct white gold band. This ring surely has a striking appearance! 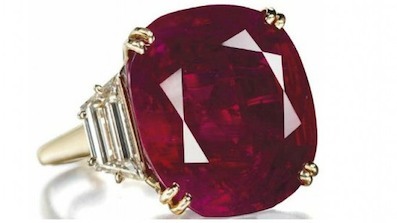 This extraordinary ruby and diamond ring fetched a monstrous $30 million. 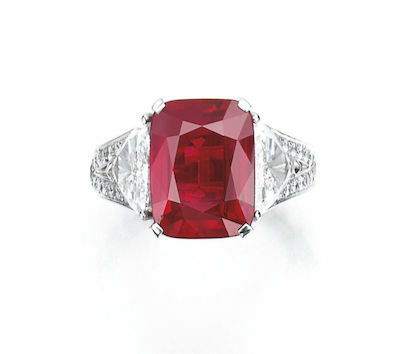 Taking the title as the worlds most expensive ruby, this ring is a part of the Cartier private jewels collection. The eye-catching centrepiece is an extremely rare cushion shaped Burmese ruby weighing 25.59 carats. This historic ruby is further enhanced by the dazzling heptagon shaped diamonds weighing 2.47 and 2.70 carats!